First of all a big Happy Birthday to Kavar Cleanslate of Exile Hair. Thank you for your creativity, your style, your sense of humour and I hope you have a wonderful Birthday. Starting from the feet up, these Grace sandals from Gos remind me so much of dancing that my first thought on seeing them was Jennifer Lopez. She did that dancing movie with Richard Gere that was just so cool. All the characters were strong and had a depth to them that made it a movie you can watch over and over again. So my first thought was a dancing dress, but then I saw these great pants from Baiastice, and they showed off enough of the leg and below to work really well, the fact that the gold buckle matched the gold shoes, didn’t hurt either. 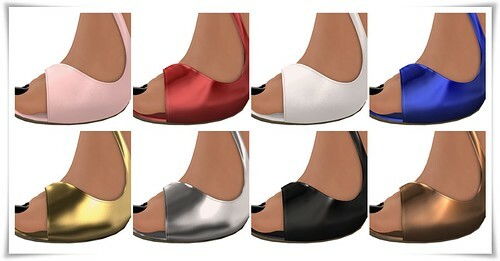 The lovely sandals are part of the recently launched Boutique line of Gos shoes, and they have a new hud system that links to a website, so that you can sync your hud to the already matched up skins available, not all skins will be a perfect match every time, due to in world lighting and viewer settings there may be the need to slightly tweak some presets, but it definitely gives you a great starting point…you can probably find tones close to the ones you wear even if the skin you wear isn’t listed. Elysium Eilde did a wonderful video on it HERE . The metallic textures and patents are realistic looking, and as I mentioned already look great when wearing other metallic like pieces. The Lima pants are so nice, with their almost jodhpurs like style, they sit just above the hips and are really comfortable yet dressy enough looking for day or night. The braided belt is also a fantastic feature. The tops worn are also from Baiastice, some old and one new, the new top is a lovely camisole style with a lovely soft print, there are solid options available in other colours as well. The skin I am wearing is from Izzie’s and she recently released some great highlight tattoo layers for lips. These are must have items, as they can definitely add some punch to older skins, as well as turning what may only be available in matte, into a glossier look…all win.